Click here for Technical Information on Mercury Contactors. Mercury Displacement Contactors are all designed and built to meet the most exacting demands of industry. Their service life is equal to that of the solid state contactor, even under adverse conditions of temperature, dust and moisture. Each pole is hermetically sealed with high quality glass-to-metal seals to prevent moisture damage and voltage breakdown through the protective coating. 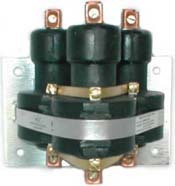 Mercury Contactors are available in single or multiple pole units and in several coil voltages. Purchase the best contactors. Superior performance and reliability for longer life and durability. More compact size for easy installation. Handles a variety of loads for increased design flexibility. Minimal derating due to higher ambient temperatures. Click here for technical information about Mercury Contactors. Our mercury contactors are comparable with the following brands: ABB, ACT, AEC, Aleph International , American Electronics, American Zettler, Amperite, ASB, ASI, ATC, CCI, Clare, Comus, Crouzet, Cougar, Dare, DME, Durakool, Eaton, Gama Electronics, Gavazzi, Greenwich, Guardian, Gunther, Hamlin, Hasco, Leach, Magnecraft, MDI, Mercury Switches, Micropac, MSI, Ogden, Omega, Omron, Panasonic, Phoenix Contact, SE Relays, Teledyne, Tempco, Thermal DEvices, VB Controls, Vertex, Watlow.